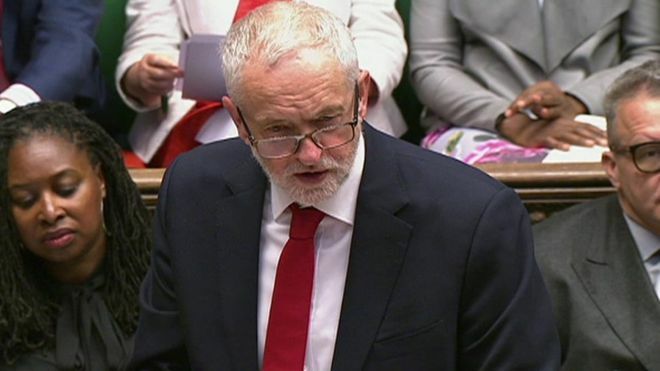 Jeremy Corbyn has compared Theresa May’s handling of Brexit with the “shambles” in the UK railways as they clashed at Prime Minister’s Questions. The Labour leader said key documents, including the blueprint for future EU relations, had been “delayed” while customs proposals had been “cancelled”. But Mrs May said she was delivering on the 2016 referendum result while Mr Corbyn was trying to “frustrate” it. It comes amid claims of cabinet tension over post-Brexit customs plans. The BBC’s political editor Laura Kuenssberg said there were concerns the latest plans on the customs backstop – what happens if there is no free trade deal or customs arrangements ready by the end of the transition period in December 2020 – would, in effect, mean the UK never leaving. There were specific objections among Brexiteers, she said, that while the document says there should be a time limit on closer ties to the EU, it doesn’t say either what that time limit should be, or whose decisions it will be to say when time is up. Pressed on the issue at Prime Minister’s Questions, Mrs May insisted that the UK would leave the EU, as planned, in March 2019 and the 21-month transition period – or what she has described as an implementation phase – would end in December 2020. But Mr Corbyn said the PM’s Tory colleagues were not “all as one” with her on that.